About a year ago, Sean Vanaman and Jake Rodkin, the co-founders of Campo Santo, asked me if I would write their company's public newsletter. They didn't want to have a typical company email list: they wanted to put out a high quality, valuable-on-its-own-merits piece of content that you would look forward to rather than immediately delete once it lands in your inbox. I've always aspired to not have my work immediately deleted, so it seemed a perfect match. 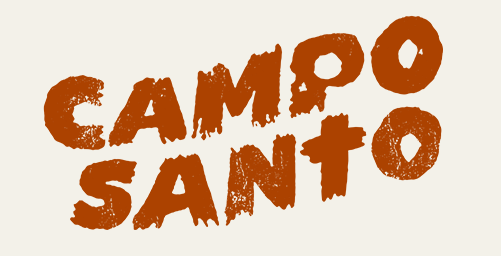 Sean's idea was that I write this newsletter in the guise of the "Campo Santo Ombudsman." "What's an Ombudsman?" is something I've thought about a lot this year. I mean, the answer is pretty straightforward, strictly speaking: an Ombudsman is an independent voice published by a company to report on its business with public advocacy as their chief concern. Appointing an Ombudsman is a gesture towards transparency and accountability. I'm not qualified -- and in fact should have been disqualified, since I'm friends with some of the people who work at Campo Santo -- but that's never stopped me doing anything before, so I took the Ombudsman's Oath and that's how the Campo Santo Quarterly Review, my mouthpiece, slithered into our dimension. I'm not sure that a True Ombudsman is what anyone at Campo Santo was really after. I think the idea of having an Ombudsman was just a funny thing to say that improbably got wished into semi-reality. I hope that's the case anyway, since what Campo Santo got with its Quarterly Review was like the furthest thing from what an Ombudsman does. We did four issues this year, four articles a piece. And it's challenging to write at length about a new game developer without being able to know or say much about the game they're making (eventually revealed to be Firewatch), and without turning readers off by mythologising a young, unproven company. Another pitfall is repeating information about the development process that Campo Santo does a good job of communicating on its own, which I failed to avoid on at least one occasion. outright fiction, like "Out of State", a pseudo-sequel to this blog's "Over and Under" containing an extremely trivial and superfluous tie-in to the universe of Firewatch. There was also "Cocktails at Pamplona", a fable about a legendary cocktail containing a human toe, which has no bearing on anything whatsoever. By the end of the year, the Campo Santo Quarterly Review was about another Campo Santo entirely, culminating in a four-part literary historical fiction about San Diego's El Campo Santo Cemetery and the Whaley family. I'm incredibly grateful to Sean, Jake and everyone at Campo Santo for the opportunity to do work that is both personally satisfying and really odd to see published by a commercial video game developer. For sure, I think the one thing you can say about the Campo Santo Quarterly Review in 2014 is that nobody had any idea what it was going to be quarter to quarter. I don't know what'll happen with it in 2015, either. But I hope you'll stay with me for whatever it is. Finally, you might note the irony of the Campo Santo Ombudsman himself being free to do whatever he wants and unaccountable to anyone. But like all sworn Ombudsmen, I will receive my judgment, when we all walk into the glade at midnight together and kneel to receive the poison kiss of the Ombudsmother. Congratulations on an excellent year of Ombudsmannery. The quarterly reviews are a delight to read and re-read, and I sincerely look forward to the next. Merry Christmas, Mr Fyfe.